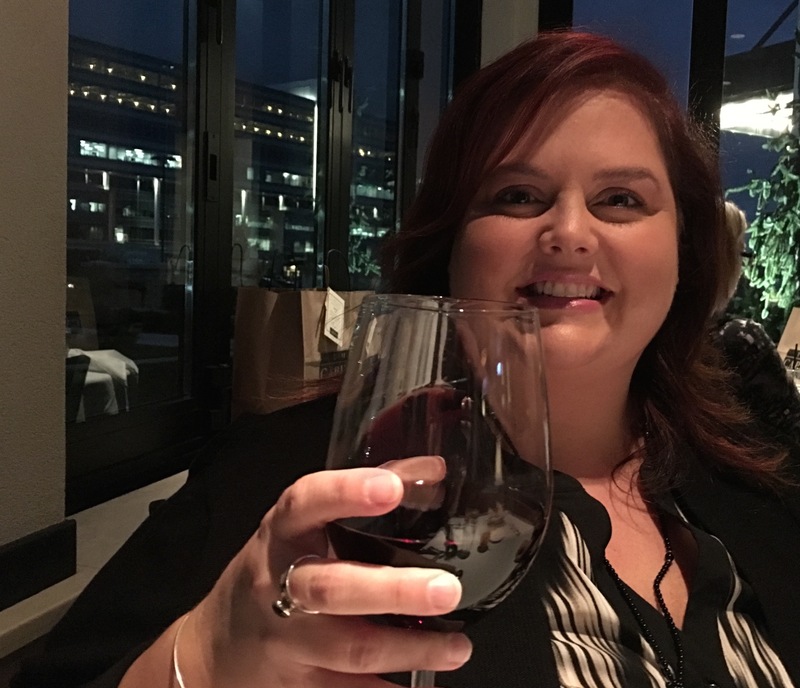 Capital Grille: Wagyu & Wine – Go There. Try That. 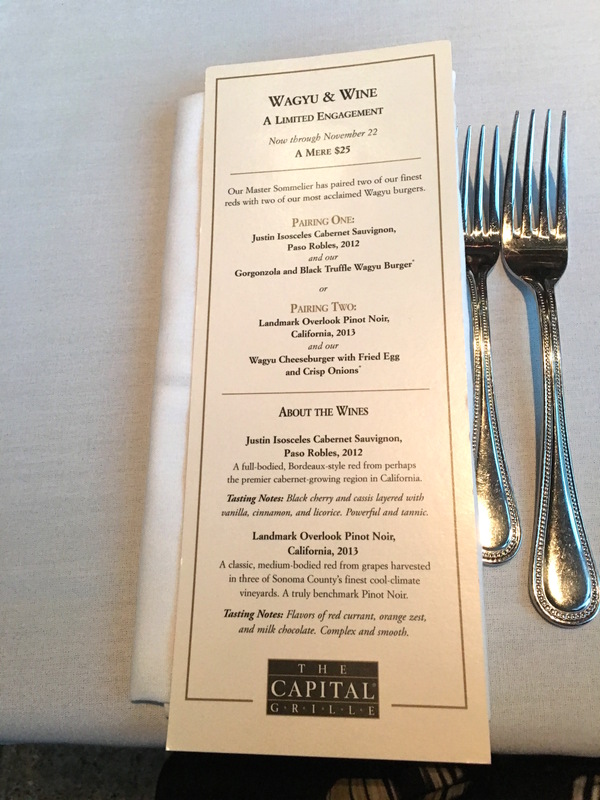 I don’t normally write about chain restaurants, but Ohio just got its first Capital Grille (in Cincinnati) and I was intrigued by their Wagyu & Wine event. I really enjoyed it, and the event ends November 22nd, so I wanted to mention it. Plus, our server Ashley was the sweetest, most attentive waitress! She deserves a special shout out! If you’re like me, you might not know what Wagyu is. I googled it before deciding to go. Turns out Wagyu translates to Japanese cow- the highly desired, high end cow! This beef is known for being rich, tender, and butter-like. The Wagyu beef served at The Capital Grille comes from Snake River Farms in Idaho and is known as the American-Style Kobe beef. Before I digress too far, I will just say that this is the fanciest hamburger this girl has ever eaten, hands down. This is a gourmet burger! My husband went with option #1 while I picked option #2. We decided to order both so we could get a taste of each burger and each glass of wine. While both burgers were incredible, I preferred the Wagyu Cheeseburger and Fried Egg. After watching many cooking shows with chef crushes like Gordon Ramsay and Tom Colicchio, I’ve learned the importance of a perfectly cooked egg atop a burger; however, this is the first time I have tried one. According to Gordon and Tom (yep, we’re friends), the creamy yolk should run out beautifully when the burger is cut in half. To my delight, this did just that. I thoroughly enjoyed the combination of the egg, beef, and cheese. The Gorgonzola and Black Truffle burger was still incredible, but for me, the gorgonzola was a little overpowering; this burger, which is tender and rich, doesn’t need masked, so I think I preferred the egg version because I could truly taste more of the meat. Both burgers were served with these fantastic Parmesan Truffle Fries. These fries, made with truffle oil and topped with parmesan cheese shavings were golden brown and crispy on the outside- just how I like my fries! Both of these wine pairings are red. My husband appreciates wine more than I and while he enjoyed both, he loved the rich boldness of the classic 2012 Justin Isosceles Cabernet Sauvignon. If you are into wine, The Capital Grille offers 350 various wines from around the world! 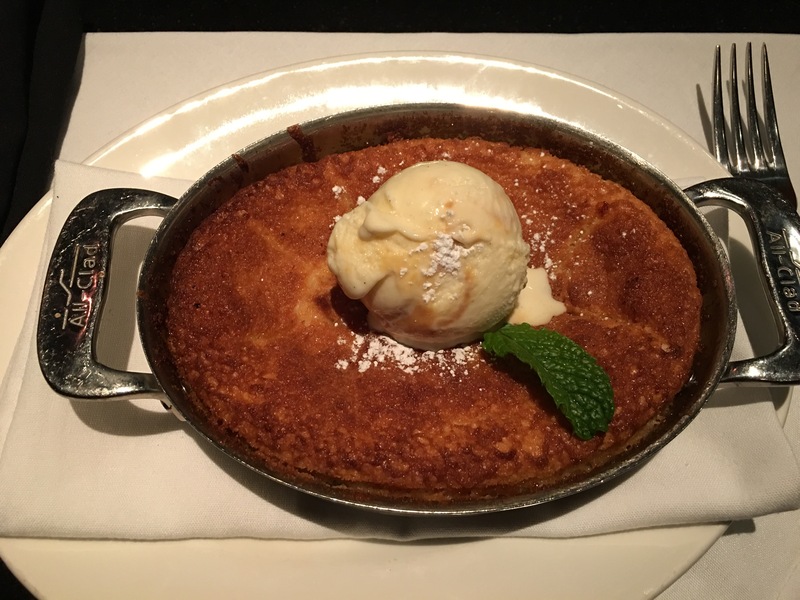 I kind of embrace the when in Rome philosophy so while we were at Capital Grille, I wanted to try something else on the menu to get a better sense of the restaurant, but it couldn’t be too much considering the meal we were ordering. Since it was a chilly fall evening, I went for the French Onion soup. I never get tired of ordering French Onion soup and for that reason, I consider myself a bit of a connoisseur. 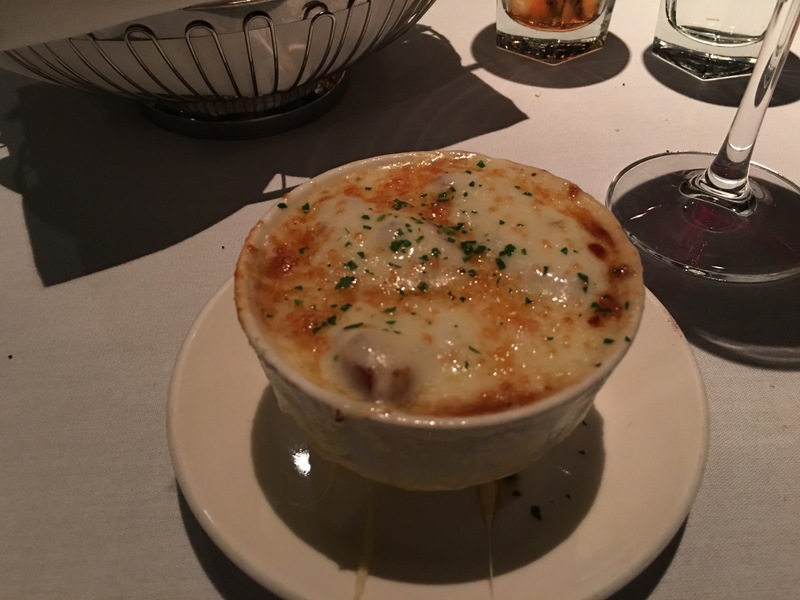 The soup served at Capital Grille was super savory and covered with several melted cheeses. Deliciously messy! This was absolutely one of the best French Onion soups I’ve had. 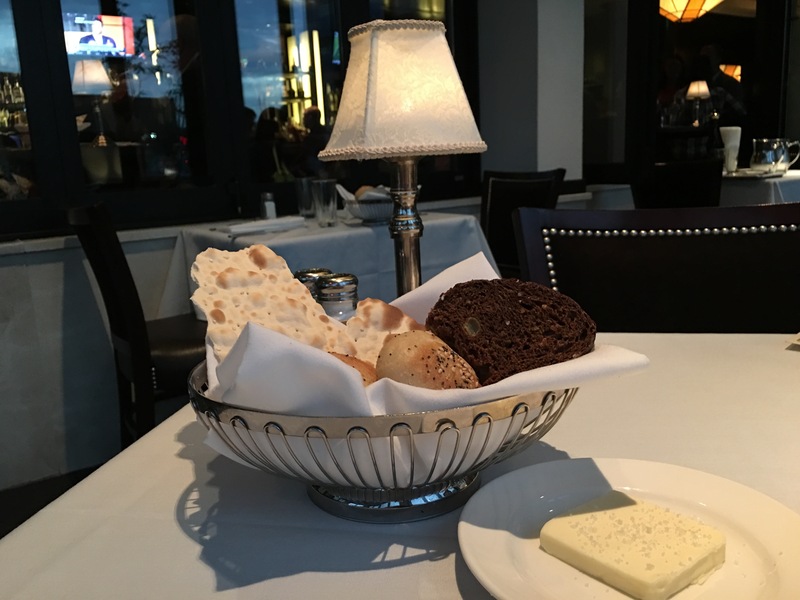 I also need to mention this bread basket. It might sound simple, but it’s not. The Wagyu and Wine event is served in the lounge (which is comfortable, cozy, classy, and close to the bar) rather than the main dining room and I’m told the bread basket might not automatically be served in the lounge, but is available upon request. You must request! Not only were we impressed with the bread itself, but this butter!? I can’t even do it justice…this heavenly creaminess with salt crystals on top. I wanted to buy this butter! We finished the night with two great desserts: a Warm Apple Cobbler served with Salted Caramel ice cream and the Cheesecake with seasonal berries. Nice way to end a date night! Both made in-house! I don’t want to take away from the seasonal Apple Cobbler, served in a small cast-iron skillet, but I have to focus on this Cheesecake, because this, this is sublime. 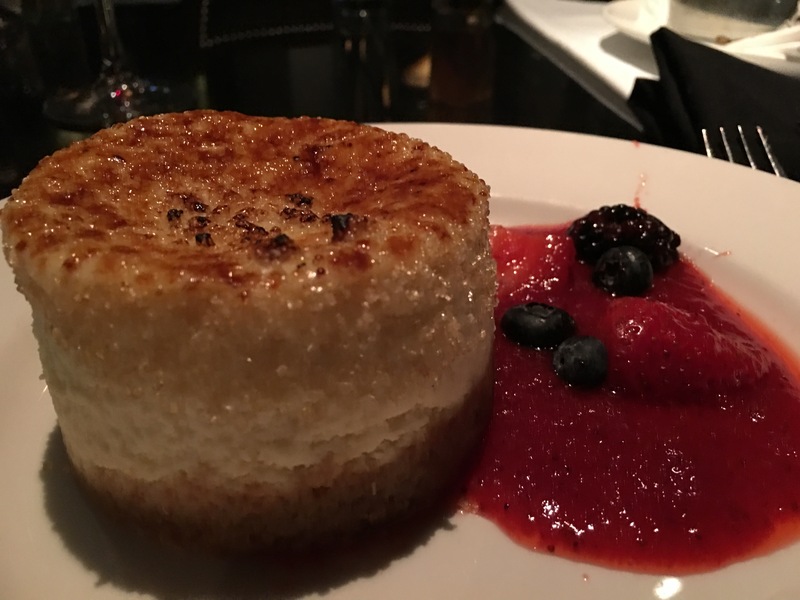 It’s like the best marriage of cheesecake and Creme brûlée. We shared bites of each, but even though we were full, it was this cheesecake we kept eating! Oh those sugar crystals, and the caramalized top, and the creamy texture, and the delicious crust…yummy! To sum it up, for $25.00, you pick from two different styles of Wagyu burgers, accompanied by your choice of two exceptional wines (typically reserved for bottle purchases only) and parmesan truffle fries. P.S.- The pictures do not do the food justice because of the dimmed “mood” lighting in the restaurant! 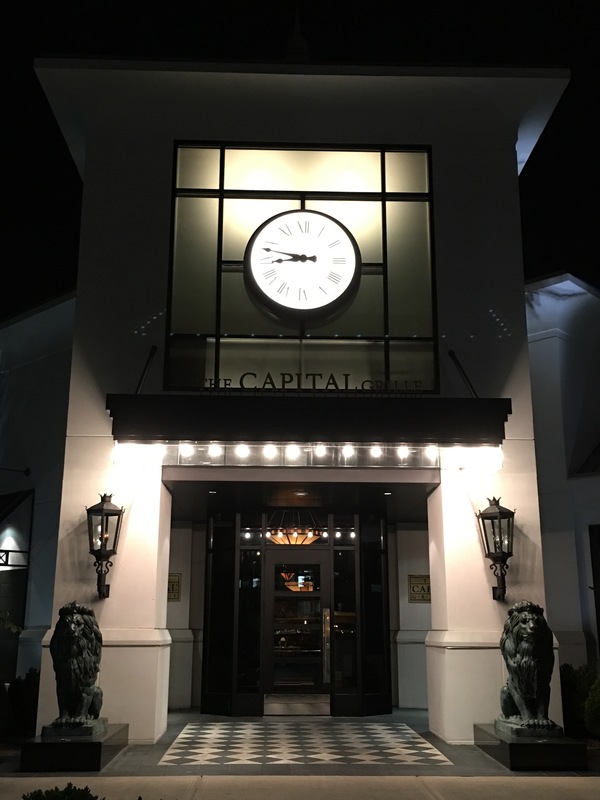 🙂 The Capital Grille is located next to Rookwood Commons if you care to do some shopping before of after! 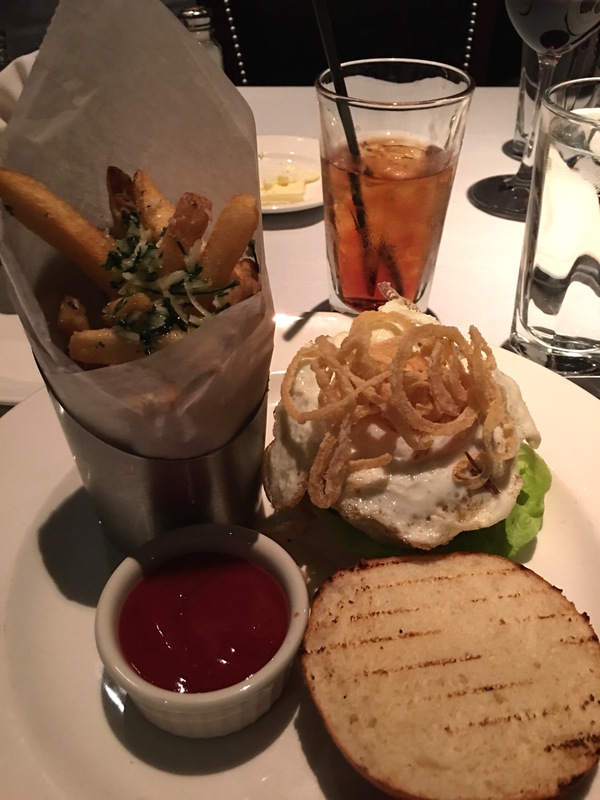 GO THERE (Capital Grille)! TRY THAT (Wagyu Cheeseburger and Fried Egg, Cheesecake)! Wonderful article . Makes me want to go. I think that any restaurant that you write about is very lucky. If you like it, you do an amazing job of highlighting the food and atmosphere. You always make me want to go. Thank you! It helps that I only write about places I enjoy! 🙂 The places I don’t care for, well, I just skip those. Thanks for being so supportive!